Superbowl Sunday is about watching the game, not spending the whole day in the kitchen. These super easy nachos give you the best of both worlds. Seasoned ground beef, refried beans and cheese form a thick layer on crispy corn tortilla chips. 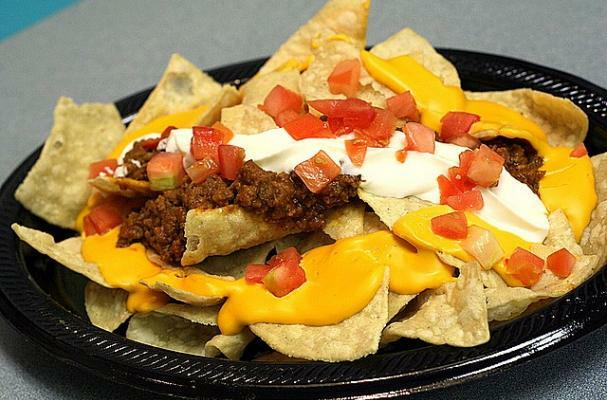 The nachos are baked in a casserole dish which makes it easier to serve when your guests arrive. Serve your nachos with plenty of sides including sour cream, guacamole, salsa, and jalapenos. Prepare meat according to directions on taco seasoning package. Place nachos in large 9 x 13 inch oven-proof pan. Top with taco meat, refried beans which have been already heated and cheese. Place in 350 degree oven until heated and cheese is melted. Remove from oven and top with lettuce, tomatoes, onions, salsa and sour cream.